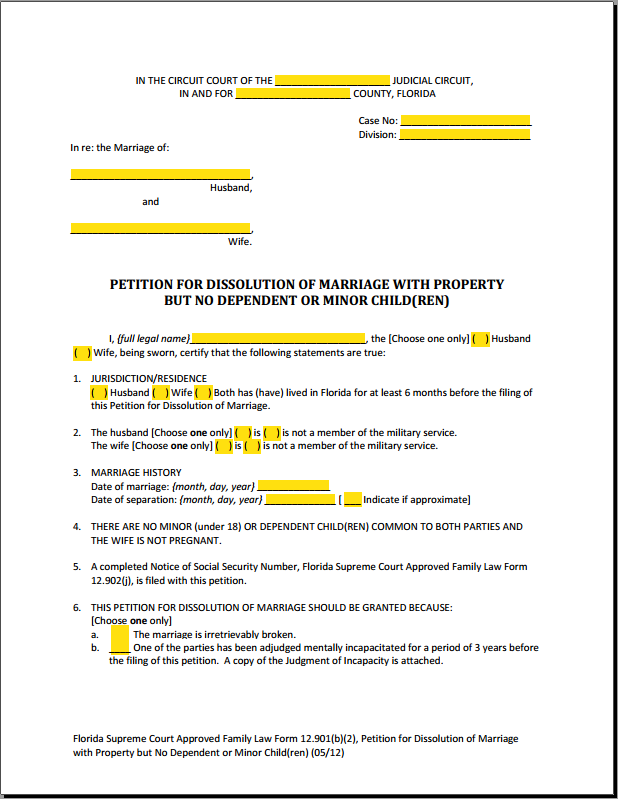 Learn how to fill out Form 12.901b2, Petition for Dissolution of Marriage With Property But No Dependent or Minor Children, with our do-it-yourself step by step instructions and helpful explanations. 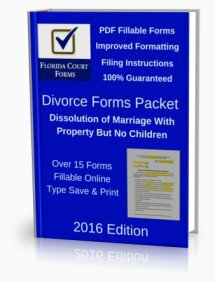 For those who do not qualify for the Simplified Divorce, Florida's regular Divorce with Property but No Children process starts with this petition... Florida Family Law Rules of Procedure Form 12.901(b)(2). Most people filing for a Florida Divorce with Property But No Children will be able to fill out all their forms by using just this page as their guide. 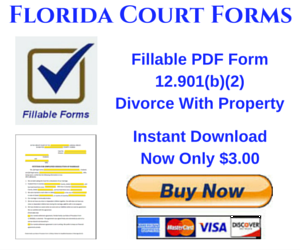 As with all of these forms, you will need to satisfy the filing requirements in order to use this form. The first page of this forms' instructions state when you can use Form 12.901b2. You would like to ask questions and get documents concerning your spouse’s income, expenses, assets, debts, or other matters before having a trial or settlement. One of you is asking for alimony. Fill out the top portion of the form, known as the style or heading. ¶ 1. This is the residency requirement. At least one of you must be a resident of Florida for the last 6 months. Check the box that applies. ¶ 2. Military service includes active reserves. Retired military does not count as active. ¶ 3. This is the marriage declaration. Write the date you were married and the date you separated. 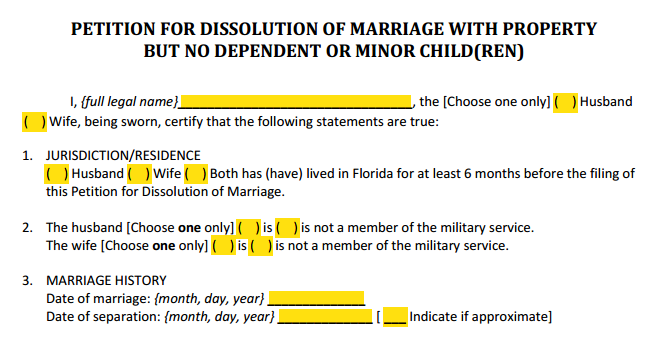 Check the box if the separation date is approximate. ¶ 4. Statement that there are no minor or dependent children common to the marriage and that the wife is not currently pregnant. ¶ 5. Your Notice of Social Security Number is filed with the Petition. Both of you will need to file this form if you are filing uncontested. You can download this form from the supporting forms box at the end of this page. ¶ 1. Check here if there are no assets or liabilities to divide and move on to Section II. ¶ 2. Check here if you do have marital assets and liabilities. These should be included in your Financial Affidavit Form available in the supporting forms download box below. a) If you have agreed on how to split your assets & liabilities and filled out a Marital Settlement Agreement (MSA) you can check here. If at all possible, we recommend that you do this. For more information, see our MSA Form 12.902f2 page. b) If you have not reached an agreement and prefer that the court determines how to divide the financial assets and liabilities, check here. 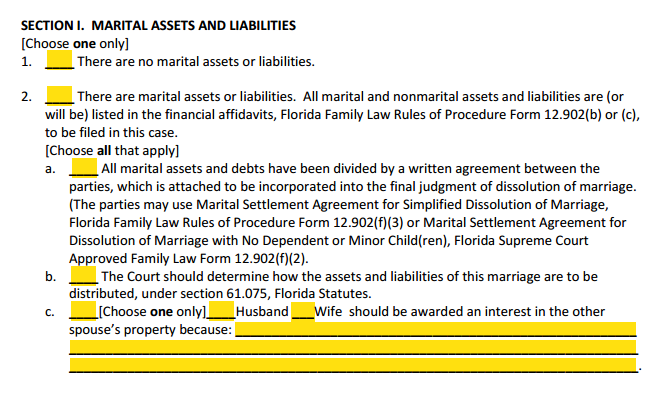 See section 61.075 of the Florida Statutes for more information on the equitable distribution of marital assets and liabilities. c) Check here if you are asking the court to order an interest in one or more of your spouse's non-marital assets. You must provide a reason for this request. TIP: Many of these sections require a skilled level of understanding. You should seek free or low cost legal consultations to discuss these areas of the law. We recommend that you consult a local attorney to go over your options. You can use this free lawyer referral service. Many lawyers offer free and low cost consultations. ¶ 1. Check here if you are not seeking alimony from your spouse and move on to Section III. ¶ 2. This is where you ask for alimony. Enter the amount of support you are requesting, how often this amount should be paid, and the date you are requesting these payments to start. You must sate the reasons why you are seeking alimony and that your spouse has the ability to pay. 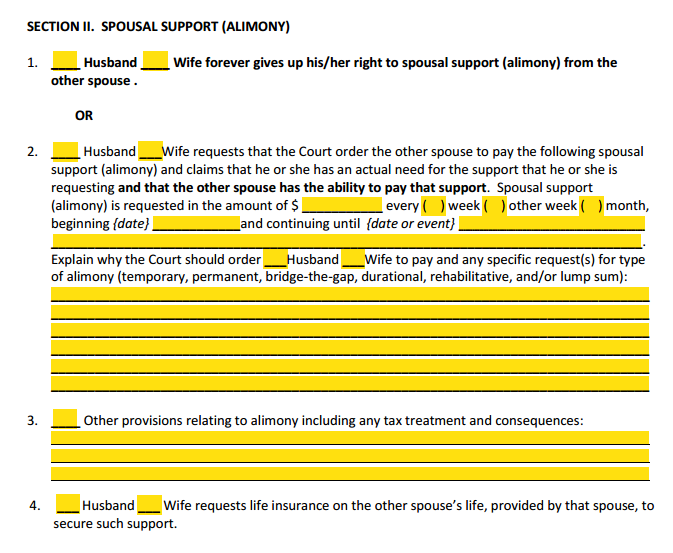 ¶ 4.This is where you request that life insurance be maintained to safeguard the alimony payments. NOTE: Alimony is a very technical part of the law, and you should seek legal advice even if you plan on filing Pro Se. See the local attorney referral recommendation we made above. ¶ 1. 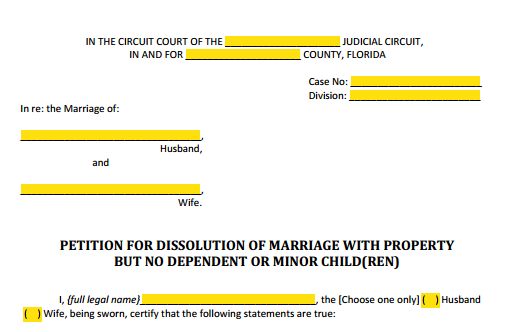 If your are the wife, and would like to have your name changed back to your maiden name or your former name, check this box and enter the full legal name here. ¶ 2. If there is a request you would like the court to order as part of the final judgment, this is where you would enter it. ¶ 1. 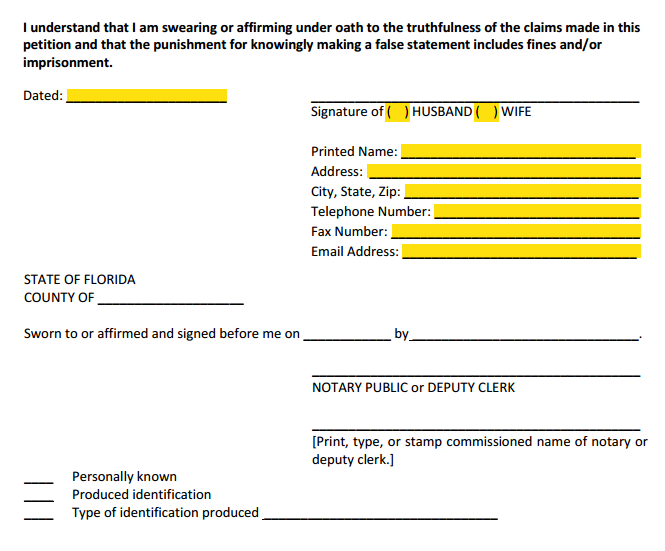 Check the box here if you are the wife and requesting your name be changed back to your former name. Write your former name in the full legal name field. After completing Form 12.901(b)(2), you will need to fill out the supporting forms as well. At a bare minimum you must file your Notice of Social Security and the Civil Cover Sheet. A Marital Settlement Agreement is not recommended if you can agree on how to divide your assets and debts. If you can, you should also complete your Financial Affidavit and the Mandatory Disclosure forms. You can file these up to 45 days after you file the petition. Remember, always make copies for your records. Supreme Court Approved form 12.901(b)(2) Petition for Dissolution of Marriage with Property but no Dependent or Minor Children. Improved formatting with properly sized blank fields and PDF fillable.